Multi-fluorescence recovery after photobleaching (MP-FRAP) is a microscopy technique used to measure the diffusion coefficient of fluorescently tagged macromolecules, and can be applied to both in vitro and in vivo biological systems. The power of MP-FRAP lies in its ability to probe thick tissue with 3D resolution. We have been developing improvements to the MP-FRAPtechnique that will broaden its already substantial applicability in vivo. Recently, we published an article introducing an alternative mathematical recovery model that accounts for the presence of directed flow in a region where diffusion measurements are desired. 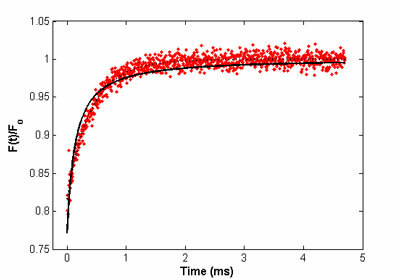 Computer generated fluorescence recovery curves with varying amounts convective flow, relative to a common diffusion coefficient. 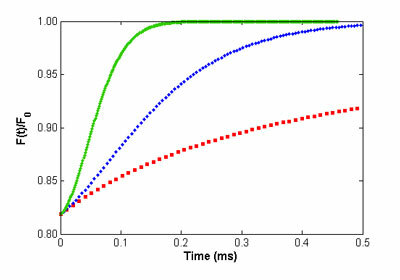 The curve of red squares has no convective flow, that with blue diamonds has a relatively moderate amount of flow, and the curve of green circles is flow-dominated. As the rate of flow increased the recovery speeds up and changes shape, becoming almost sigmoidal for dominating levels of flow. This alternative model is especially applicable inleaky interstitial regions, and can be used to measure plasma viscosity, a common gauge of several disease states. Currently, we are probing the effects on photobleaching recovery when MP-FRAP is performed in a constrained environment. We are also working in collaboration with Mitchell Anthamatten (Chemical Engineering) to apply MP-FRAP to a novel question in the field of polymer-structure relationships. Representative diffusion-only MP-FRAP recovery curve for FITC-BSA and associated least-squares fit. Representative MP-FRAP recovery curve for FITC-BSA in the presence of flow, and associated least-squares fits. The solid line represents the fit made using the standard diffusion-only recovery model, and clearly mis-fits the data. The dashed line represents the fit made using the diffusion-convection model we recently developed, and fits the data beautifuly.